I’m in love. An e-reader has won my heart. Its name is Nook and it’s become my constant companion. I adore the huge print, the ease of page swiping, and the light weight in my hand. I also like paying $4.89 for The Hunger Games so it can tuck me in at night. I don’t miss propping hardbacks or even paperbacks on my stomach and trying to make pages stay put. The lazy reader I’d become is no more. I fought getting an e-reader for some time. It seemed decadent when I have shelves full of unread books. Then a good friend gave me this surprise gift, and it gave me permission to try 21st century reading. When the Nook competes with the desktop and the iTouch, it wins handily. The iTouch, helpful for checking email, is not the right screen for many pages. And the desktop? No contest. My neck and back thank you, dear Nook. Now I’m reading literature on the weeknights again, whether in bed or on the sofa. The Hunger Games delivered via Nook is the tool of my conversion. Touche, technology. Thou hast outwitted thyself and brought my reading life back! As a writer, I love loading my critique group’s manuscripts on this device. Reading their work while I’m kicked back in a chair, bed, or sofa changes the whole dynamic. The manuscript has a different status when read this way–easily, like a book, yet without the pressure of pen and paper. I’m no longer feeling the need to “do something” with their pages. Before, I’d have their print-out with a pen close by or be sitting uncomfortably at my desktop, and that quickened my tendency to look for things to mark. I’m reading more receptively and humbly, giving the manuscript a more thoughtful, peaceful read. This new approach helps tremendously when reading first drafts. Writers in first-draft mode need global comments and questions, not line edits. My temptation to home in on some of their trees and prune the branches has disappeared. When you seek the flaws too quickly, you’re missing the bigger mission, and until a writer is sure of that bigger mission, all that sound and fury of the line-edit pen is wasted time. When it comes to actually writing a critique or marking notes, I assume an iPad would prove superior, giving me the ability to mark up manuscripts with a note-taking app. But I’m happy enough right now with this new view of others’ writing, canoodling with my multi-functional Nook. This doesn’t mean I’ve emptied my nightstand. Housekeeping, Souls Raised from the Dead, Alice Munro’s stories, the Bible, and a pile of other books await me there. The two voluminous Harry Potters are loans from a friend who’d no doubt like them back, especially if I don’t finish them before Pottermore opens for e-business. But the rest? They’ll stay. Housekeeping is an ’80s copy my sister loved on again and again; I’d like to read that artifact. Souls Raised from the Dead bears Doris Betts’ autograph; that’s a treasure I won’t lose. The Bible I read slowly, carefully, sometimes the same bit over and over. Turning pages of these works, ’tis no work at all. As my husband sings, Some things are better left alone. Great post, Lyn. You (almost) make me want to ditch my Kindle. Bob, didn’t you do comparison shopping…does the Kindle have some features Nook doesn’t? Yes, Kindle lets you download for free w/o wifi, it has a lot of storage (3000+ books), and I have the larger version with a page-size screen. Too, you have access to all of Amazon’s book trove. It’s black and white, but it’s easier to read outside than an iTouch. What I miss is color. At the time I was comparing, you could only buy the books B&N had on their website, which wasn’t exactly a selling point. But you made it sound so enticing…. I refuse to be convinced! 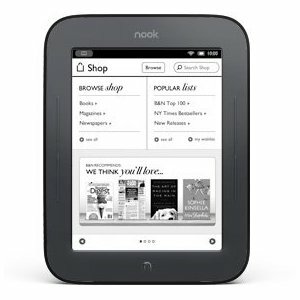 Well, I’ve never really tried a Nook, but I can complain about my friends’ Kindles and iPads all day. (My iPad complaints are unrelated to e-books, though.) I’m just really comfortable with the way I currently do things, and even if I got used to an e-reader I’d still hate it everyone once in a while. Some days I just want to throw my mobile phone into the sound. Maureen! Wow! So great to hear from you, even if you do hate e-readers. 🙂 I know what you mean about mobile mess; we’re overconnected and stimulated and who knows what else. We need to catch up! Dare I ask if you’re on FB? Write me at lynhawks@gmail.com and send all your news!